Why would you blame your child’s teacher? I can think of a couple of students whose parents fit the bill. It saddens me, but I cannot be anyone other than who I am and who I was created to be. I tell my students, “You will never have another teacher on this Earth exactly like me, and that is truly a shame.” It’s not meant to be narcissistic, but it is true. Other educators will be similar to me or remind the students/parents of me, but there will never be one who is my exact duplicate. I’ve even told my tougher classes that I would lay down my life for them. Whether they believe me or not is not my problem, but it is my heartfelt responsibility to give the younger generation a chance to live their lives. The sensitive souls’ eyes tear up when I’ve said this statement. Their hugs are the longest at the end of the year because they know I meant what I said. The key thing to remember is that in life, we encounter people who don’t always agree with us or get along with us. This is okay. It is not acceptable to bash teachers who work their tails off, lose hours with their families, and compete with all of the new technology and information overload available. Please walk at least one week in my shoes when they are excited about summer vacation for the last six weeks of the school year, and some of them mentally check out. “We’re finished with our STAAR (State of Texas Assessments of Academic Readiness) tests. That means no homework, right?” Wrong! Please grow eyes in the back of your head to watch simultaneously in the hallway and the classroom. Please attempt to motivate students who lack the intrinsic drive to accomplish a task that needs to be completed. Make them read books they despise in May. Give them writing assessments, and insist that they use good grammar at all possible times. Hold your tongue when an adolescent makes a sarcastic comment that flays open your skin. Substitute in a classroom on a Friday in the spring semester, and toss out the lesson plan because “it seems silly.” Go ahead, I dare you. The majority of my students are model citizens. The vocal minority consume my time, efforts, and energy because some parents did not invest the time to read to their children, to listen to their children, and to discipline (correct lovingly) their children. I cannot undo the damage of eleven or twelve years in ten or so months, yet I (and thousands of other quality educators) make the valiant attempt every single year. 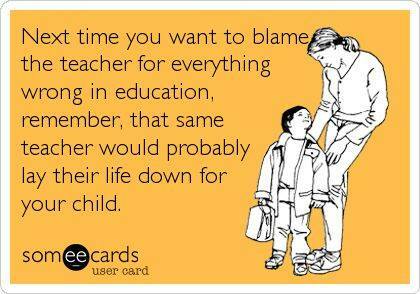 Please don’t blame teachers; encourage them to stay in the classroom. When I ask a student to do something, I expect him or her to do it. When I direct them, I expect them to comply. Because I am an adult, I expect obedience. I do not expect to hear an excuse, a reason, or an explanation unless I specifically request it. I will not ask them to do anything that is detrimental. My parents taught me that I was to do what they asked when they asked and how they asked. I didn’t get to stomp off in a huff, roll my eyes, slam the door, mumble under my breath, and huff and puff loudly in anger. I had to maintain self-control. As a result, I marvel at some young people who find it acceptable to regard me as an equal. I am not their equal except on a human being level. I am the boss. I give directives for their protection, edification, and education. I do not speak words just to hear the sound of my voice. I expect a “Yes, ma’am” and to see feet in action, period. One day, when my students are adults, they will enjoy this same privilege. I too had to wait to become an adult. It took years, but I made it, and they will too, one day at a time. My students who see me in classroom every day know that I love them. I tell them so. This is not about them. There are some students who make me wonder why do I teach. Others make me scratch my head in dismay after I’ve tried yet again to figure out their puzzle box. Still others’ smiles light up my world simply because they love me. I see it in their eyes. I don’t teach them. I don’t work with them on a regular basis. I am simply in the hallway and talk to them, and they love me. Some girls compliment my clothing or accessories. Others smile shyly at me as I stand sentinel to prevent misbehavior in the hallway. Some of the boys give me a high five (or we bump elbows in ‘flu season) and a “Hey, Mrs. Johnson” as a greeting. I simply don’t always understand why some of them seem to really love me. On those days when I don’t feel I deserve such admiration, I get a greeting or unexpected reminder that they are also part of the reason I am here. One young lady recently stopped by to see if I needed help straightening my room up. I normally don’t let these little darlings work in my room, but something about Sweet Girl made me say yes. She tidied up my literature books and organized my book shelf. Sweet Girl always has a smile for me in the hallway. I am always glad to see her face as she walks by in between classes. I introduced her to my student intern, Mini-Me, and they smiled the smile of “We’ve got to get her together, or else chaos will once again reign.” You can just tell when they do the silent head nod. I am happily doomed. Mini-Me was in my classroom six years ago. She asked to be in my classroom; I could not believe that she asked ME. Once again, I wondered why she’d be interested in working with me on a daily basis. Hadn’t she managed to escape my clutches? She has only blossomed into a beautiful young woman as she has gotten older. Her inward beauty and old soul never changed. She keeps me organized, and I am keeping her in Reese’s candy and whatever goodies I happen to bake in my kitchen. Mini-Me is a true gift to me in part for keeping me organized but also for keeping me accountable with some of my more challenging clientele who require long walks of prayers each morning. I pray for wisdom so that I can minister to them according to their needs. When I feel the need for Mrs. Johnson’s Sermon Number —, she stops what she’s doing, listens, and affirms me with a nod. I know she understands what I am trying to do: give my babies some much-needed insight before turning them loose into the next grade. One of my all-time favorite students is in his last year of middle school. He and I connected two years ago in the hallway because he had a bum right knee and was on crutches. This is Birthday Buddy. I went to the school district’s track meet to watch my former students run. His team won their race and are district champs. I yelled my head off as he took the baton, ran faster than I’ve seen him run, and successfully pass off the baton to the last man of the team. It was a thrill. As I drove home, I reflected on the life lesson he has taught me: it’s okay to be loved and accepted by someone other than your family or friends or students of record. Sometimes they love you in spite of yourself. The LORD chose my husband, and the LORD blessed us with our son. My close girlfriends and I are sisters of the heart. This young man, my intern, and Sweet Girl are beautiful reminders of the unconditional love God set down on Earth two thousand years ago. With them I see hope for the future and know in my heart that teaching young people is exactly what I am supposed to be doing. They may never, ever know the impact they have on my life, but I assure you, I sure do. I love these three and will make it a point to tell them face-to-face when next we meet. A thousand pardons because this rather pesky wind keeps blowing dust into my eyes in my office. It makes my eyes water, you know.